Silver Dangle Hoop Earrings with White Gold Shepard Hook. Petite Hand-Engraved, Hand-Placed, Satin Finished 12k Green Gold and 12k Rose Gold Split Grape Leaf. Diamond Cut Edged Teardrop Earrings Designed just for you in South Dakota, USA. 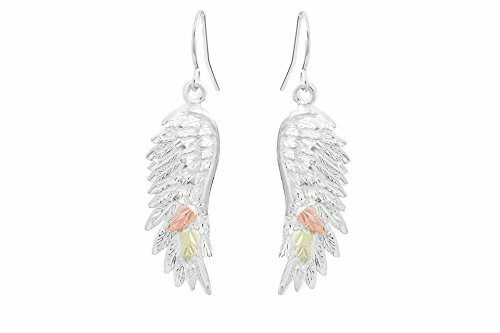 .925 Sterling Silver Rhodium Plated Earrings. Earring Measures 1.12" X .49"inch. inch. Usually Ships in 2 Days. Certificate of Authenticity and Manufacturer's Limited Lifetime Warranty Included. Silver Dangle Hoop Earrings with White Gold Shepard Hook. Diamond Cut Edged Teardrop Earrings Designed just for you in South Dakota, USA. Earring Measures 1.12" X .49"inch. inch. Usually Ships in 2 Days.